Kids are never too young for chores! My younger boys have been doing chores since they were two. Now that they are older, they have many jobs around the house. My teenage son also helps around the house when he is able to but he does his own laundry. The teen is a senior in high school so I want him to focus on his school work and other things that will help him get into college (like all the many scholarship applications.) My thinking about kids and chores is you are a part of the family so you help out. I also do not pay my kids for chores nor give them an allowance. I know that my kids doing chores will help them when they move out on their own. The very first chores that I can remember my youngest doing is folding laundry. My oldest daughter was tired of having to fold clothes so she taught the boys how to fold. I am all for passing the job to someone else as long as it gets done. My boys use to climb into the dryer to get the clothes out. I received a Nugeni to facilitate this post. Jesse was so excited to get his own vacuum and I do really mean that. This is a boy who likes tools and things that make noise. When the Nugeni arrive Jesse had a blast vacuuming all around the house. His brother just could not understand why Jesse was having so much fun. Jesse said, " I love vacuuming!" 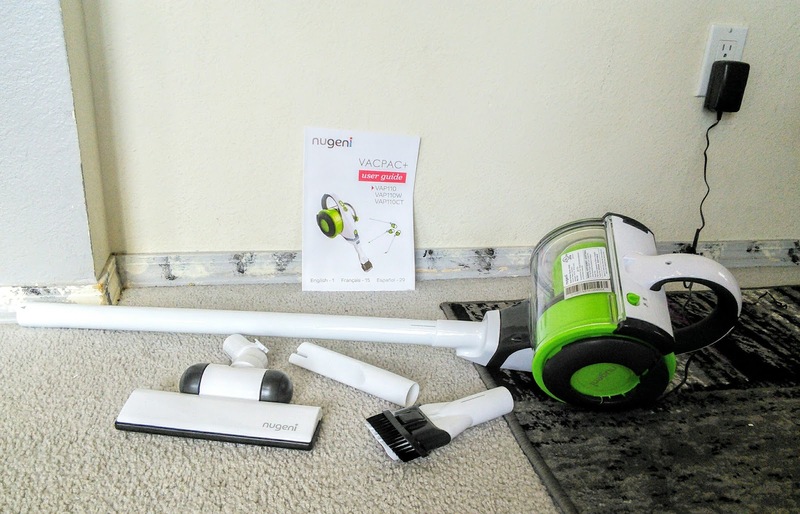 His new Nugeni VACPAC+ is very lightweight and comes with a bunch of tools so he can vacuum up all the mess in the kitchen. I love that the VACPAC+ is rechargeable so my boy cannot vacuum up the cord or tangle it up around the furniture. This vacuum may be small but it is powerful and has a big storage for all those crumbs. 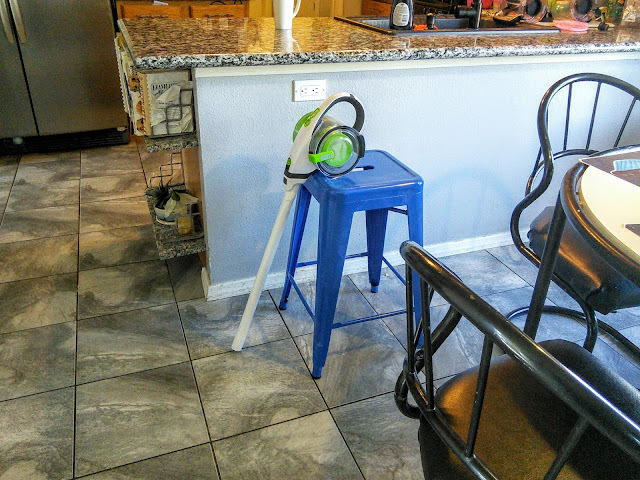 The VACPAC+ can be used as a handheld vacuum and Jesse loves using this to get the crumbs off the kitchen counter. 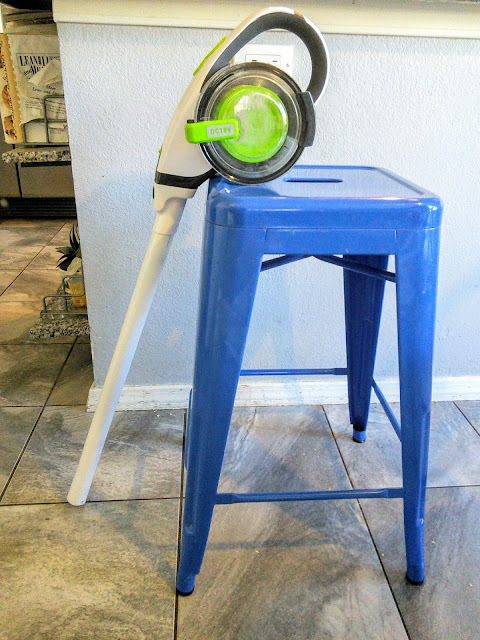 When he wants to get all the crumbs off the floor, he just adds the extension wand and the hard floor tool to the VACPAC+. I think his favorite tool is the crevice tool so he can get all those hard to reach places. My boy gets very excited when he sees how full the dustbin is. He then empties all his treasure of crumbs into the trash can and plugs the vacuum back into the charger. The VACPAC fits perfectly in the corner of my laundry room so Jesse can access it anytime he makes a mess in the kitchen. 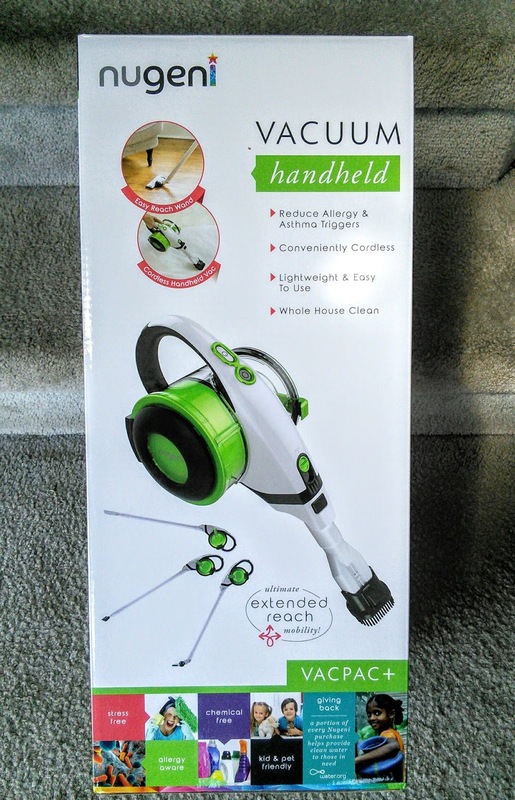 The teen also enjoys using this lightweight vacuum as it is so easy to take upstairs to clean up all his hair after he gives himself a haircut. 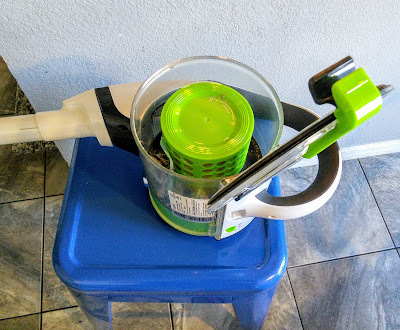 For now, Jesse just uses the Nugeni in the kitchen but I think his next chore will be vacuuming the stairs. The nugeni VAC+ is a powerful, lightweight and cordless handheld or upright vacuum with our patented 3D Turbine Motor. Featuring our AllergyAware filter with Dual Layer technology, the nugeni VAC+ helps reduce allergy and asthma triggers for whole house health. Reach inaccessible places high and low with the power of an upright and the ease of a handheld. With the wide range of included accessories, you can customize your cleaning needs for any space. This is so cool! I have never seen this brand before, but it looks awesome and super helpful to teach kids! I have been looking for a new lightweight vacuum. This one looks nice. I like that is is cordless. We could get a lot of done if we had one of these. My kids do chores as well and one of them is doing their own laundry. This would be perfect for our house. With two dogs we have a lot of hair to lean up. I am all for anything that makes chores easier. I think that is great that your children do chores. I found my kids loved doing them when they were younger than when they got older. I will say though your children will be prepared when they leave home where as my kids I felt I needed to make sure they knew how to do their laundry and things like that. Teaching your children to do chores is so important! This is a great reminder that everyone can help out at home. It is so important to give your Children chores to do to help out around the house. Everyone can contribute to the household in their own way and this is a great way to teach responsibility. This definitely looks like a great way to get the kids involved in chores! Such a great thing! I have never seen these products before but they look awesome. I totally need to look into getting one. Wow what amazing way to get kids doing chores. I've never heard of nugeni, but I'd love to pick one of these for a friend with kids. She's been needing ways to help entice them to do so. 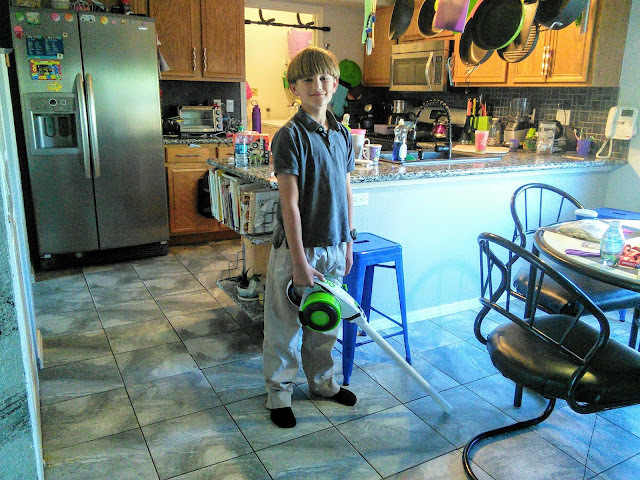 Getting kids to help with chores is a must around our home. 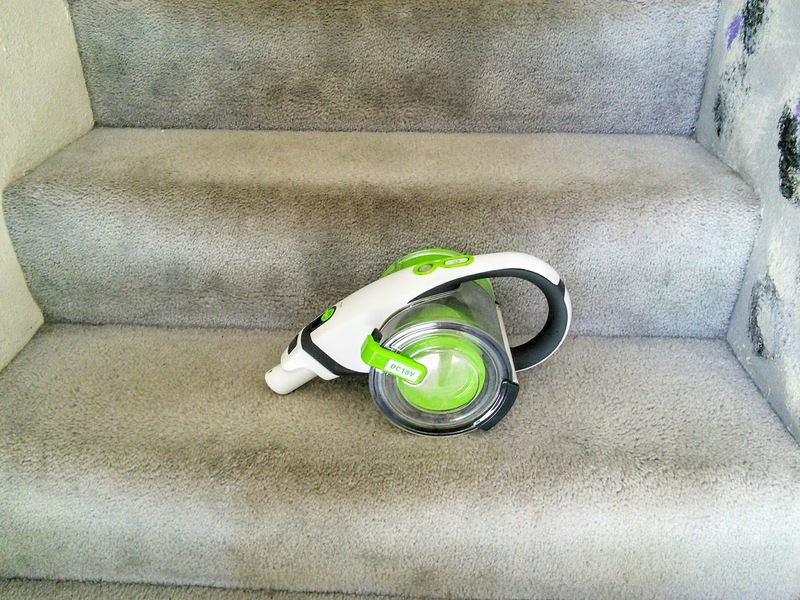 I love how this unit converts for the perfect size for cleaning the steps. First time to know this brand but the product is definitely cool. And i like the color they sent you, very refreshing, and functional. I have always thought that kids should have chores. It shows them responsibilities I believe. The Nugeni VACPAC+ sounds like a great and easy way to clean up them little messes quick and easy. Thanks for sharing your story and this awesome vacuum.